You are here: Home / All posts / Are Olives Healthy? If you came here for an answer, here it is in short: absolutely! This fruit is bursting with nutrient-dense qualities, flavor and healthy fats. Olives and olive oil are staples of the Mediterranean diet, and it’s no secret they’re one super healthy region. That’s not our only reasoning, though. 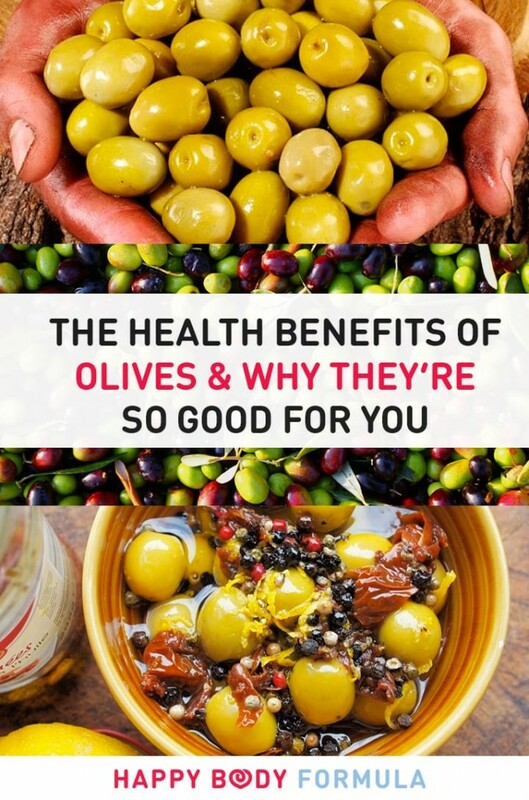 Olives are easy to incorporate into your diet, and many people flat out enjoy ’em, so find out why they’re such a fantastic food in the first place. Olives have plenty of antioxidant power which inherently makes them a good food to reduce oxidative stress and inflammation; this means olives are an anti-cancer food, and can even reduce chronic pain by reducing inflammation all over. Spanish green olives and Kalamata olives, in particular, can almost act as an NSAID. Next time you think of popping Ibuprofen, try antioxidant-rich olives instead. The antioxidants also reduce “bad” cholesterol by preventing the oxidation of it and reducing damage to the blood vessels. Woo, antioxidants! Vitamin E is one of the top nutrients for healthy skin, nails and hair. Vitamin E is also a contributing factor to olives being considered a strong cancer-fighting food, considering its ability to neutralize free radicals. Vitamin E also provides our skin with better protection from harmful UV rays. Lastly, you can be sure you’re absorbing your vitamin E because it’s paired with fats in the olive, increasing its bioavailability. Ripe olives are definitely not a tasty food you want to eat. The fruit is bitter and unpalatable, so it needs to be fermented before consumption. Fortunately, this offers us not only taste but some awesome, gut-friendly bacteria as an added benefit. This is a good reason to source fresh olives, as some big manufacturers skip the fermentation process. This doesn’t make the olive an unhealthy food, but the fermentation process certainly adds some nutrition. As a rule of thumb, most CANNED olives (not jarred) are not fermented. Oil from olives helps our bellies to produce bile and get our pancreas working – two very important facets of the inner workings of healthy digestion! On top of being a fabulous fermented food with bacteria to maintain the integrity of the gut and being a good food for prevention of colon cancer, olives are one of the best foods for good digestion. They also contain quite a bit of fibre, helping us to keep things moving south at the proper pace. These are the good kinda fats. Monounsaturated fatty acids help us to produce good cholesterol, contributing to reduced risk of heart disease overall. Monos can also decrease blood pressure, the risk of colon cancer and they are thought to boost weight loss. Finally, they help absorb fat-soluble vitamins, one of which is vitamin E (conveniently found in olives!). 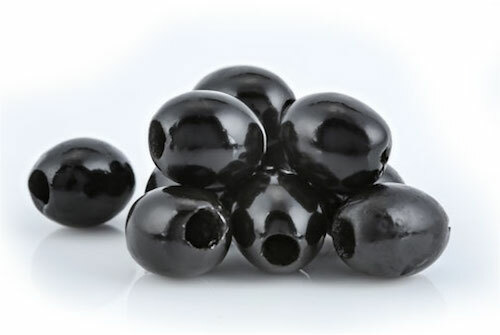 If you need a boost of iron – and many folks do – just toss back a few black olives! Our tissue needs oxygen, and iron increases oxygen delivery throughout the body which positively impacts our circulation, and can help us feel more energized and less cold. Iron also helps to keep the immune system happy and strong. If you want to source the best olives, it’s best to visit specialty markets or bulk antipasto bars. These will give you the best quality, best price and most variety. Otherwise, it’s always best to choose organic and read the labels for any additives like colors. Here are some brands we trust at HBF for the best and tastiest olives. Oloves snack packs. These are pre-portioned bags of olives you can take with you on the go. I love having these for a snack to keep me going. It’s an easy way to get some healthy fats when you need an energy boost or get a craving at any time. Jeff’s Naturals Whole Castelvetrano Olives. Step outside the box with some “fancy” olives. Perhaps you’re not a fan of black or green, but there’s much more to try! Castelvetrano olives are loaded with flavor, and they have an almost buttery texture. Bragg’s organic extra virgin olive oil. Olive oil contains many of the same health benefits that olives do. Sourcing a quality, organic product is key! Olives are versatile and can be eaten as a quick snack or cooked into gorgeous recipes. They’re also a fantastic, healthy restaurant option. If you’re out for Italian food, for example, you could ask your waiter if he or she might be able to bring out a basket of olives to snack on in place of the bread that comes out. You could also substitute croutons on a salad with olives sometimes. Sure – they’re no sourdough, but they are a healthier, lighter option that won’t bog you down before dinner even arrives! Baked tomato & olive chicken from Pure and Simple Nourishment. With its one-pan ease and gorgeous mix of tangy olives, sweet tomatoes and fresh herbs, this is an extra healthy and extra easy weeknight dinner with potential for leftovers. Spiced lamb cutlets with eggplant puree & tomato olive salad from Eat Drink Paleo. This dish really brings in all of those Mediterranean flavors, making olives a suitable and necessary addition to this fresh salad. Bacon-wrapped olives from Primal Palate. Need we say more? Swoon over this appetiser. Nobody dislikes olives when they’re wrapped in bacon. Grain-free olive, caramelised onion & herb drop biscuits from Wicked Spatula. We hope you found these fun facts helpful. Tell us – black or green olives? Share this article on Pinterest.